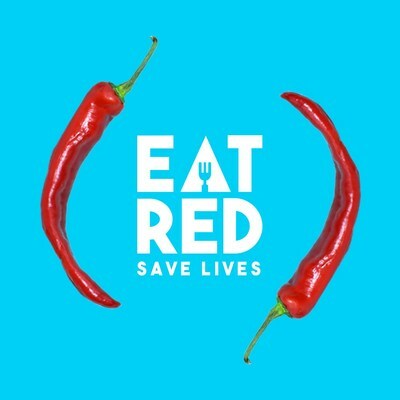 NEW YORK, June 1, 2017 /PRNewswire-USNewswire/ -- Today, EAT (RED) SAVE LIVES -- led by Chef Mario Batali -- brings the culinary world to the table to raise money for The Global Fund and awareness around the AIDS fight, with activations across the United States and around the world on social media. From New York to Chicago to Los Angeles, national restaurant groups and popular food brands nationwide are making it easier than ever for people to EAT (RED) throughout the entire month of June, with multiple ways to turn food and drink choices into a force to fight AIDS. A new EAT (RED) SAVE LIVES campaign PSA, voiced by Mario Batali, highlights the importance of people's food choices this June, and underlines the power of life-saving HIV/AIDS medication that costs just 30 cents a day in sub-Saharan Africa. "It's a beautiful thing when food not only brings people together, but does so in a way that means real impact on the AIDS fight. Thanks to the enthusiastic support of so many of my heroes in the culinary industry we're taking the campaign all across the country. So whether you're eating, drinking or joining the emoji food fight on Twitter, your choices really do count this June," says Mario Batali. Deborah Dugan, CEO of (RED), commented: "It's so inspiring to see the culinary community wrap its arms and apron strings around a fight as important as this. We're enormously grateful to Mario and every one of our EAT (RED) SAVE LIVES supporters for making it easy for everyone, everywhere, to become a key ingredient in the fight to end AIDS." Throughout June, consumers can look forward to the following activations that make purchasing popular foods – lobster rolls to pizza, salad to waffles and more! -- into choices that #86AIDS. Blaze Fast-Fire'd Pizza - Grab a signature (RED) Vine Pizza and an ice-cold Coca-Cola drink, and $1 will be donated to the Global Fund, up to $50,000. The Bill & Melinda Gates Foundation will match the donations made by Blaze. Jimmy John's Gourmet Sandwiches is generously supporting the AIDS fight this June with a $100,000 donation to support the work of The Global Fund. Jimmy John's will also promote EAT (RED) SAVE LIVES and create awareness through a special '(RED)' Snapchat filter at their 2700+ locations in the United States. Building on the success of the Jonathan Adler designed (ANDAZ)RED Suite at Andaz West Hollywood, the Andaz brand is continuing its support of (RED) in the month of June by going (RED) for breakfast at Andaz hotels (Maui, West Hollywood, Savannah, Scottsdale, Napa, and both 5th Avenue and Wall Street in New York). For every person who dines in a participating Andaz restaurant for breakfast, the hotel will donate $1 and offer each diner the opportunity to match the donation to double the impact. Each participating hotel will also offer a special signature breakfast item that triggers a $3 donation. Hedley & Bennett has collaborated with longstanding (RED) Chef Ambassador, Dominique Ansel, recently named the World's Best Pastry Chef by the World's 50 Best Restaurants awards, to create a limited-edition custom apron available for order only during the month of June on HedleyandBennett.com. Luke's Lobster is turning their iconic lobster roll '(RED)' in June! At all 24 Luke's Lobster locations guests will be given the option to add a $1 donation to fight AIDS to their check. For every dollar donated, Luke's Lobster will also donate $1, up to $3,000. Max Brenner will add two (RED) menu items to their brunch offerings– a strawberry sugar waffle, topped with Max Brenner's velvety white chocolate sauce, freshly whipped cream and milk chocolate chunks, and the (RED) mimosa. The Cheesecake Factory and (RED) partner, Coca-Cola, are joining forces to feature their iconic Ultimate (RED) Velvet Cheesecake & ice-cold Coca-Cola on menus to raise awareness, in addition to a $20,000 donation to fight AIDS. Lou Malnati's Pizza is offering a special "Spreading Hearts Box" during June, nationwide. The box includes a heart shaped pizza and a heart shaped chocolate chip cookie, as well as two tiny pewter hearts for the recipient. Home cooks can also EAT (RED) this June, with limited edition (HELLOFRESH)RED meal kits with exclusive easy-to-follow recipes created by (RED) Chef Ambassadors Mario Batali, Emeril Lagasse, Rachael Ray and Carla Hall. For every new subscriber who orders a (HELLOFRESH)RED meal kit at www.hellofresh.com/eatRED using code HELLORED, HelloFresh will offer a $20 discount off the first box and make a $20 donation to fight AIDS. Customers can select one (RED) recipe, plus two others, as part of their weekly HelloFresh delivery. The Bill & Melinda Gates Foundation will match every donation by HelloFresh, up to $500,000. All customers will have an opportunity to donate directly via the HelloFresh website. New this year, the first-ever EAT (RED) FOOD & FILM FEST!, presented by Bank of America, will take place in the evening of June 20 in New York's Bryant Park. Mario Batali, Jean-Georges Vongerichten, Ina Garten, Danny Bowien of Mission Chinese and The Beatrice's Angie Mar have collaborated in creating the ultimate evening picnic, giving food fans the opportunity to savor their dishes. Ticketed guests will also enjoy an outdoor screening of Sleepless in Seattle, (BELVEDERE)RED summer cocktails, Birra Moretti beer and wine by Josh Cellars. A limited number of tickets are available at ticketmaster.com/EatRED for $100, with 100% of the ticket price going to fight AIDS with (RED). Thanks to dollar matching by Bank of America and The Bill & Melinda Gates Foundation, every ticket purchased will generate $600 to fight AIDS. Additionally, (RED) and Bonnaroo are teaming-up with legendary James Beard Foundation Award-winning chef and author, Hugh Acheson for an unforgettable (RED) Supper @ Bonnaroo on June 8. Raising money for the Global Fund, the family-style festival dinner takes place as the first night of Bonnaroo 2017 swings into action. Guests will enjoy Hugh's special three course (RED) menu, with tickets priced at $75, and 100% of the ticket price going to fight AIDS. Starting June 1, a new EAT (RED) SAVE LIVES Facebook Messenger bot will give food fans zip code-based details of where to EAT (RED) SAVE LIVES during June, GIFs and sharable food puns. On June 5, the #REDFoodFight is coming back, giving people the opportunity to tweet food emojis at friends, using #REDFoodFight for a food fight in the name of EAT (RED) SAVE LIVES. "(RED) is great at coming up with smart, innovative ways for people to support the AIDS fight. The disease has had a devastating impact over 35 years, and though we've made huge progress, campaigns like EAT (RED) SAVE LIVES help to remind everyone that we need to keep our feet on the gas to end it for good," said Marijke Wijnroks, Interim Executive Director of the Global Fund. (RED) was founded in 2006 to engage businesses and people in the fight against AIDS. (RED) partners with the world's most iconic brands that contribute up to 50% of profits from (RED)-branded goods and services to the Global Fund. (RED) Proud Partners include: Apple, Bank of America, Beats by Dr. Dre, Belvedere, Claro, The Coca-Cola Company, GAP, MCM, Salesforce, SAP, Starbucks and Telcel. (RED) Special Edition partners include: aden+anais, Alessi, ALEX AND ANI, Andaz, Fatboy USA, Fully, Girl Skateboards, Le Creuset, mophie, S'well, and Vespa. To date, (RED) has generated more than $465 million for the Global Fund to fight AIDS, Tuberculosis and Malaria, to support HIV/AIDS grants in Ghana, Kenya, Lesotho, Rwanda, South Africa, Swaziland, Tanzania and Zambia. 100 percent of that money goes to work on the ground – no overhead is taken. Global Fund grants that (RED) supports have impacted more than 90 million people with prevention, treatment, counseling, HIV testing and care services.